When you move into a place with a yard that isn’t mowed for you, lawn mowers become a sort of passive enemy. They sit there, reminding you that when the grass starts growing, you’ll have to spend important hours of your life cutting it regularly because we’ve decided as a society that manicured yards are superior. There’s also the fact that grass is itchy and exists to make people sneeze, which doesn’t help its cause. But that bitterness, my bitterness, often shields me from remembering that super mowers exist and that people race lawn mowers—both of the “super” and not of the “super” kind, I would assume. That’s a true flaw of mine. Alas, Honda’s 189-horsepower new Mean Mower V2 has reminded me of my frequent failures to recognize that machines built to cut grass are not just tools of domestic drudgery. Not only is this thing about to try to top 150 mph and set a new record for world’s fastest lawn mower with an engine from the CBR1000RR Fireblade motorcycle, but it can also tear it up in the grass at any speed. 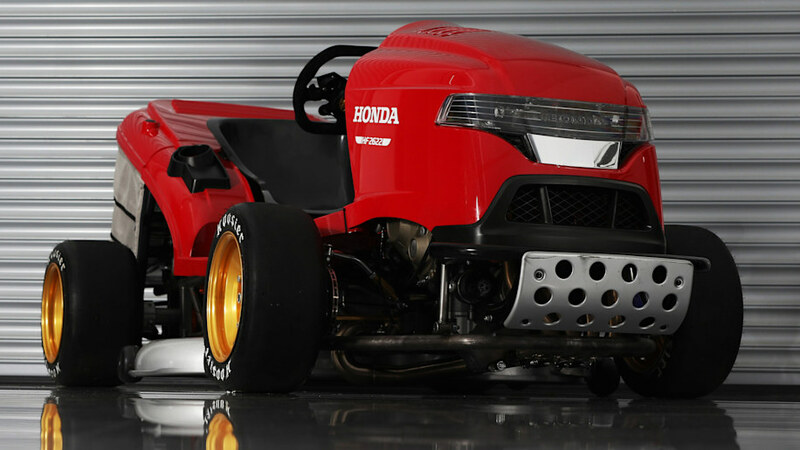 Honda also told Jalopnik, after running some numbers, that the mower could probably cut grass at 50 mph in the right circumstances, which would, honestly, relieve some of the stress that traditional grass mowing causes in the first place. Let’s all pool our resources and start hosting rallies with lawn mowers that are way too powerful for their own good. My yard would be a great season opener. Here is a video of a Honda lawn mower driving hilariously fast up the Goodwood Festival of Speed hillclimb. The only thing missing are Mariokart music and Donkey Kong tossing bananas at it. Sure, it's a ridiculous publicity stunt by Honda, but who cares? It's fun, lighten up Francis. The lawn-cutting implement in question is Honda's latest, greatest and nuttiest. Dubbed the Mean Mower, it features a 999-cc four-cylinder from a Honda Fireblade motorcycle that produces 189 horsepower. It's connected to a six-speed manual transmission and Honda will attempt to hit 150 mph with it at a later date. An older version of the Mean Mower hit 117 mph. There's also no suspension, so here's to the poor guy who suffered for our collective amusement. Now, we're not entirely sure why the Mean Mower stops in the middle of its hillclimb. Perhaps the aforementioned driver spotted some road-lining grass in need of a trim and pondered letting the Mean Mower do its more natural thing. After all, it does have functioning carbon fiber grass-cutting blades. Look for more videos of interesting vehicles racing up the Goodwood hillclimb. They're bound to be cars, though, and will probably not be as amusing as a lawn mower. With or without bananas.